7 For All Mankind striped shirt, may be worn with hem tied or untied. 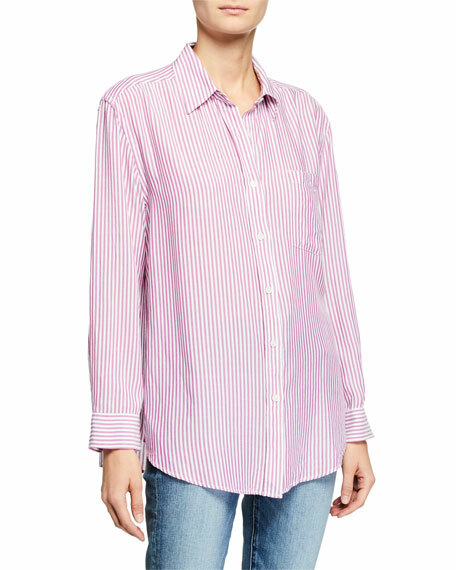 Go Silk striped woven big shirt. Approx. measurements: 31"L from shoulder to hem, 34"L down center back. Spread collar; button front. Long sleeves; barrel cuffs. Shirttail hem. Loose fit. Cotton; hand wash. Imported. Model's measurements: Height 5'10"/177cm, bust 33"/84cm, waist 25.6"/65.2cm, hips 35.8"/91cm, dress size US 2-4/FR 34-36. Libertine "Lightning" classic shirt in beaded plaid. Spread collar; button front. Long sleeves; button cuffs. Classic silhouette. Shirttail hem. Dry clean only. Made in USA. Model's measurements: Height 5'10"/177cm, bust 31"/79cm, waist 24"/61cm, hips 34"/86cm, dress size US 0/2. Libertine classic shirt with patchwork details. Spread collar; button front. Long sleeves; button cuffs. Classic silhouette. Shirttail hem. Cotton; dry clean only. Made in USA. Model's measurements: Height 5'10"/177cm, bust 31"/79cm, waist 24"/61cm, hips 34"/86cm, dress size US 0/2.